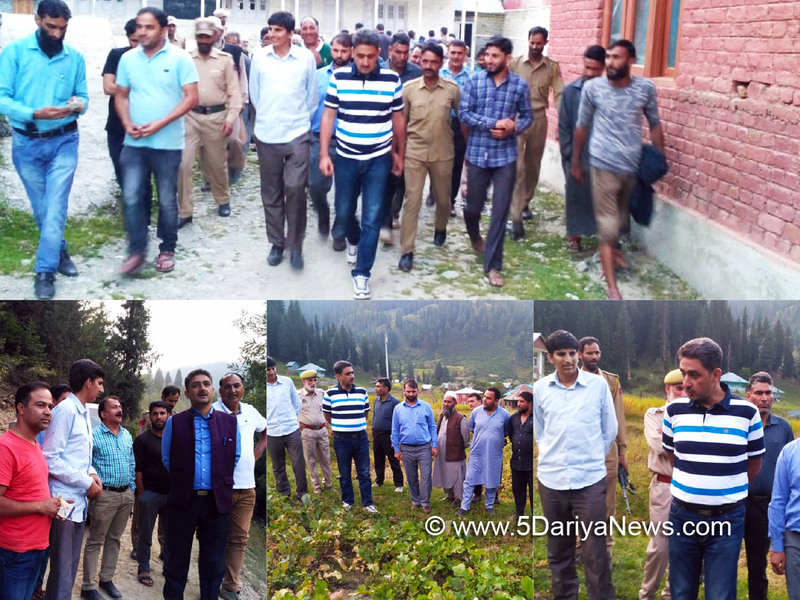 District Development Commissioner Kupwara, Khalid Jahangir, today conducted an extensive tour of Machil area to take a firsthand appraisal of development works being executed by various agencies there.The DDC also reviewed the implementation of directions of Advisor to Governor, K. Vijay Kumar, which he issued during his recent visit to the frontier area of the district.The DDC visited Ring Bala and Ring Payeen areas and inspected various works there besides interacted with the locals and assured them of early redressal of their projected issues.Locals, particularly youth demanded playground at Machil to which DDC issued on spot directions to the concerned so that youth are provided avenues for sports and other recreational activities.The DDC inspected the site identified for construction of a helipad in the area and directed the concerned to ramp up the pace of work for its timely completion before the onset of winter.During his visit, DDC also inspected various facilities in Duddi Hospital and instructed concerned authorities to explore ways of building accommodation for the employees working in Machil in the vicinity of the hospital.He directed health authorities to construct ramps for easy transportation of patients requiring emergency healthcare. He also directed concerned to construct fencing around the hospital and improve the aesthetics in and around the hospital premises.He also inspected various roads, schools and other works executed under MGNREGA. He issued directions to authorities to construct fencing walls around schools in the area.The DDC urged locals to avail benefits of State and Central sponsored schemes like MGNREGA and assured them of all possible cooperation from district administration towards augmentation of developmental infrastructure and improving the overall developmental profile of Machil.Meanwhile, DDC emphasized upon the officers to conduct regular visits to Machil and implement in letter and spirit directions issued by the Advisor within the stipulated time frame.The DDC was accompanied by ACD Kupwara, Exen REW, Tehsildar Machil and other concerned officials.